The £35m ($62m) probe should have landed at 0254 GMT on Christmas Day after a six-month flight. Nasa's Mars Odyssey orbiter has since flown over its landing site but failed to detect the expected call sign. 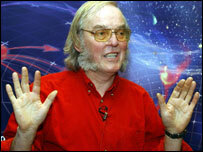 Lead scientist Professor Colin Pillinger insisted that "it's not the end of the world". The giant Jodrell Bank telescope, in Cheshire, UK, will come on line at about 2200 GMT to listen for signals. Scientists are confident that sweep will pick up a signal from Beagle 2 - if it has made it to the planet surface in one piece and is functioning as expected. However, if nothing has been received by the end of 26 December, hopes for Beagle 2 will start to fade. The probe must recharge its batteries on the day it lands or it will not survive the first night on Mars. Speaking at the Open University's offices in Camden, north London, Beagle's lead scientist, Professor Colin Pillinger, told reporters: "Please don't go away from here believing we've lost the spacecraft. "I'm afraid it's the usual England scenario - we're going to play extra time," he said. "We always thought we would put Beagle into hibernation because we did not want to risk wasting any power during the first night. "There is absolutely nothing we can do until the computer attempts to wake Beagle up tomorrow on Mars but tonight on Earth". He added: "If we do make contact (on 25 December) we cannot send any information either to or from Beagle, all we will be able to do is say that Beagle is alive and attempting to transmit to us." 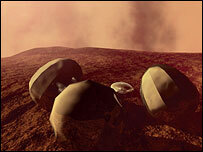 Mike Healy from Beagle 2's constructor Astrium UK said he had not contemplated a "negative scenario". "It really should have been able to communicate with Odyssey this morning. Prof Pillinger said they were now "into extra time"
"But it could have landed in the wrong place or it may not have opened successfully, and the aerial may be pointing in the wrong direction." He also said there was a "small possibility" Beagle 2 was not able to communicate properly with Odyssey, as it had originally been designed to communicate with Mars Express at this stage. 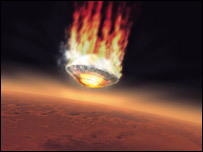 Beagle 2's plunge through the thin atmosphere of Mars, slowed by parachutes and cushioned by airbags, is the most dangerous part of the mission. The worst case scenario is that Beagle has crashed and is lying in fragments strewn across the Martian surface. But another member of the Beagle team, Ian Wright from Open University, said there was "no point contemplating that one at the moment". "There are still plenty of things to try," he said. If successful, Beagle 2 will embark on a 180-day mission to search for signs of life. The one piece of good news early on Christmas morning was Mars Express, in another high-risk manoeuvre, successfully entering into orbit around the planet. The craft will send back 3-D pictures of the surface and scan for underground water with a powerful radar. But the historical odds of success for Beagle 2's mission are low. 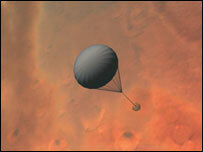 Despite more than 30 missions launched to the Red Planet since the 1960s, only about two-thirds have been successful. Three landers have reached the Martian surface; all costly American missions, unlike Beagle 2, which was put together in record time and on a shoestring budget. "Missions to Mars do have a high failure rate"